Philadelphia artist Rebecca Rutstein was selected by a committee of eleven members for this commissioned project which began last spring. The fifteen artists originally considered for the project were eventually narrowed down to five, who then presented their work, before the committee decided on Rutstein’s concept. Rutstein presented a concept for eighteen floating cloud sculptures constructed of bent steel that started at the base of the garage and float up to the top of the five story building, breaking the architecture at the top of the structure. Each 5 x 10’ cloud was designed to be wired and back-lit to allow for the possibility of various lighting compositions. The committee was most excited about the variety of the lighting concepts, which includes a “starry night” feature in which the clouds twinkle with an illuminated node star effect. The sculpture project, titled “Sky Terrain,” was created with 16-gauge steel that glistens and gleans in the sunlight, often casting shadows on the crème colored building supporting it. “Sky Terrain” also picks up hues from the surrounding buildings, sometimes appearing pink and lavender during the day. Shortly before sunset, the lighting program begins with bands of color, ranging from blues to warm pinks and oranges, emulating a sunset. As the day turns into dusk and evening, the lighting program imitates “Blue Hour”, a period each morning and evening when the sun is a significant distance below the horizon and the residual, indirect sunlight takes on a predominantly blue hue. There are additional lighting designs that are part of the programming including an artistic array of red and white illuminations that will be featured on Temple Univeristy “Game Days” on campus. The overall concept of the lighting is to utilize intense hues to evoke the light found in the nature. Rebecca Rutstein not only wanted to make an impact on the immediate lighting needs of the corner at 11th and Montgomery, but also hoped to give the students and others in the community who utilize this highly traveled corridor, an opportunity to pause and reflect. 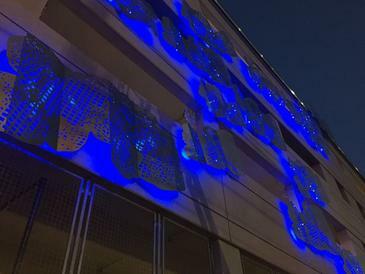 The addition of cloud-like forms floating effortlessly and changing colors during the day and then transform in the evening through animated lighting that mimics the sky and simulates twinkling stars, is an opportunity for the public to enjoy these nature-inspired phenomena in an urban environment.